The Badminton Horse Trials is a three-day event, one of only six annual Four Star events as classified by the Fédération Équestre Internationale (FEI), which takes place in April or May each year in the park of Badminton House, Gloucestershire, England. Badminton was first held in 1949 by the 10th Duke of Beaufort in order to let British riders train for future international events and was advertised as 'the most important horse event in Britain'. It was the second three day event held in Britain, with the first being its inspiration - the 1948 Olympics. The first Badminton had 22 horses from Britain and Ireland start, and was won by Golden Willow. Eight of the 22 starters failed to complete the cross-country course. Badminton was the home of the first European Championship in 1953, and was won by Major Laurence Rook on Starlight XV. In 1955, Badminton moved to Windsor Castle for a year, at the invitation of the Queen, in order to hold the second European Championships. Badminton was first televised in 1956. In 1959, it was decided to hold Badminton in two sections, called the Great and Little Badminton, due to the popularity of the event and the number of entries. The horses in the two sections jumped the same fences, but were separated into the two divisions based on their money winnings. This graded approach was abandoned after the 1965 event. In 1989, the current director & course-designer Hugh Thomas, who rode in the 1976 Montreal Olympics, took over from Frank Weldon, a former winner, who is credited with bringing the event to the pinnacle it's at today. Today's Badminton is held in a 6 square kilometer (1500 acre) area Badminton Park, where the car parks, tradestands, arena and cross country courses are located. Between 1961 and 1991, Badminton was sponsored by Whitbread, one of the longest sponsorships for any sport. In 1992, Mitsubishi Motors took over sponsorship and recently renewed their deal until 2011. Did you know? 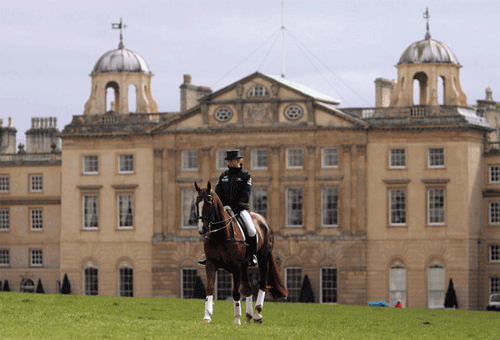 The Badminton Horse Trials attracts over 250,000 visitors a year, making it the second largest paid-entry sporting event in the world.